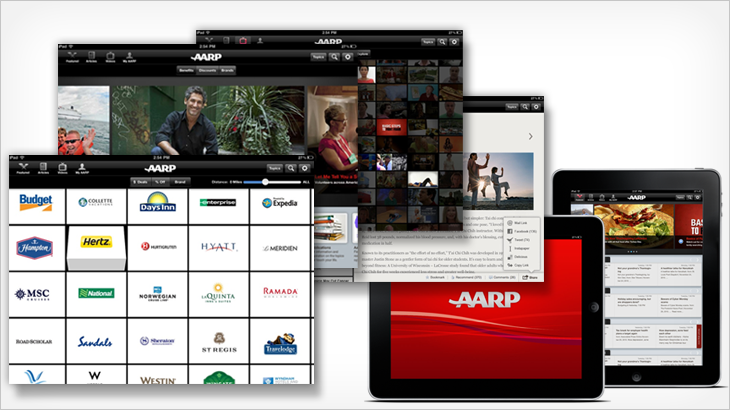 Reaching all of AARP’s 40 million members in every digital platform... a work in progress. AARP’s 1st iPad direction takes advantage of the form factor of the device to highlight the most popular aspects of the organization, it's discounts and the content for the 50+ audience. The design concepts in this app vary dramatically from the iPhone and Android app counterparts; including more playful interaction, user customization, use of location data, etc.